Six-year-olds come in different sizes, so there isn’t a formula for matching age to bicycle size. The right bicycle size for your child depends on her height and leg length. You may want to surprise her with a bicycle for a birthday or holiday, but to ensure a safe and comfortable ride, she must be involved in the selection. 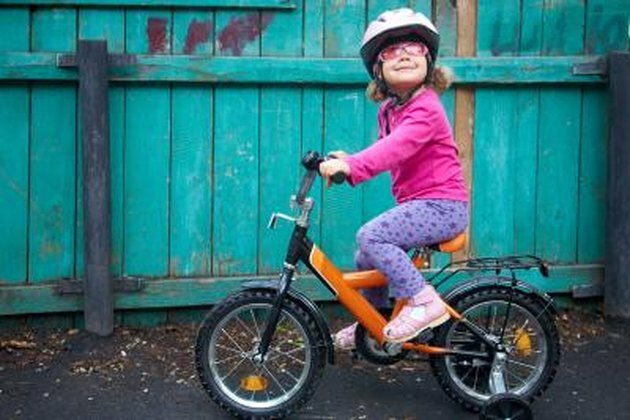 Because a well-made children’s bicycle costs nearly as much as an adult’s, you may be tempted to buy one that your child can grow into. Don’t give in to this temptation because it’s very dangerous to put a child on a bicycle that’s too big for him to control. To get the right fit, start by measuring your child’s height and inseam -- the distance from the crotch to the bottom hem of his slacks. Unlike their adult counterparts, children’s bicycle sizes denote wheel diameter. If your child’s height falls between 34 and 42 inches and her inseam is between 16 and 20 inches, she will fit best on a bicycle with a 14-inch wheel. If your child is in the same height range, but has a longer inseam, in the 18- to 22-inch range, she needs a 16-inch bicycle. For a larger 6-year-old measuring 42 to 28 inches in height with an inseam of 20 to 24 inches, choose an 18-inch wheel. Height and inseam measurements give you a good starting point, but to ensure the bicycle fits well and that your 6-year-old will be able to handle it, take him with you to the store and have him mount and dismount bicycles in at least two sizes. Look for the size that he can straddle with both feet flat on the ground. He should be able to mount by tilting the bike to one side just slightly and he should be able to dismount easily. Ensure that his knees won’t hit the handlebars as he pedals and check to make sure he can reach the handlebars easily without leaning in a way that compromises his balance. Children develop according to their own schedule and not all 6-year-olds are ready to ride a bicycle. Some have not yet mastered the necessary physical skills and some are not emotionally ready for the inherent risk of falling. Talk to your child about a bicycle and listen carefully to how she responds. If she expresses fear or hesitation, she may not be ready yet. Also, 6-year-old children lack the hand strength to operate hand brakes, so choose a model that comes with coaster brakes.